Muffins with Raspberries are the Berry Best! 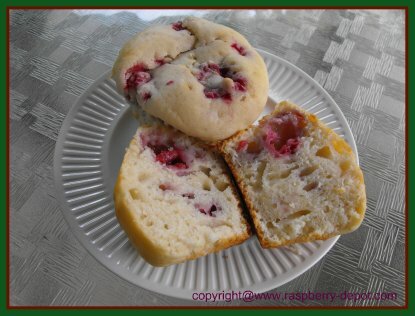 This Raspberry Muffin Recipe uses fresh raspberries to give that explosive taste to the taste buds! 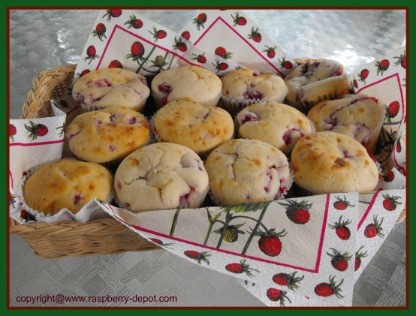 Homemade muffins made with raspberries make great brown bag snacks or a quick breakfast or brunch idea. Raspberries are low in calories, and packed with nutrients and anti-oxidants, making them a berry healthy choice! Buttermilk is included in the ingredients listing, however you can substitute the buttermilk with regular milk and add one teaspoon of vinegar. If you have fresh blueberries on hand, you can use one cup of blueberries and one cup of raspberries instead of using only raspberries. In a large bowl, using a fork, mix together the butter and sugar, until the sugar is well dissolved. Add the eggs to the above mixture and mix again. In a separate bowl, whisk together the flour, baking powder, and the salt. Combine the egg ingredients with the dry ingredients stirring just until combined. Do not over-mix. Fold in the fresh raspberries, being careful not to break them up too much. Spoon mixture into greased or paper lined muffin cups, filling about 3/4 full. Bake at 400° for approx. 25 minutes or until done. Enjoy these muffins warm or cool. You can wrap any left over muffins and freeze them. Then, when you are looking for a healthy snack for your lunch or break-time, pop it out of the freezer and into your lunch bag or the microwave!